Generated using char-rnn by Karpathy (here: https://github.com/karpathy/char-rnn) to train a neural network on the syntax of Paul Simon MIDI files. I converted MIDI files of all of Paul Simon's songs into text, concatenated them all into one large text file, and trained the network for about 16 hours on it. I've only completed seven epochs before generating this sample here, so there's a lot more training to be done. One can already hear the network develop some idea of Paul Simon though. Karpathy has an excellently-detailed blog post about neural networks here: http://karpathy.github.io/2015/05/21/rnn-effectiveness/. 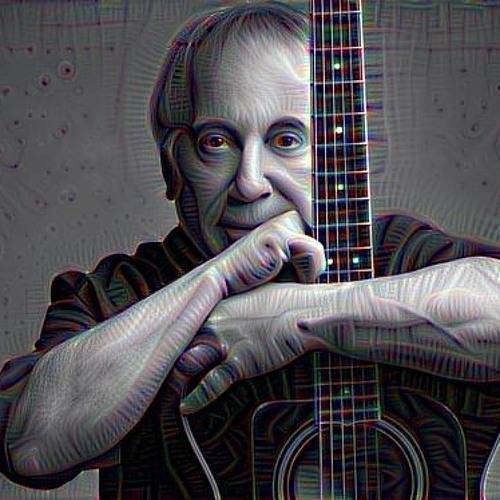 The cover image is one of Paul Simon put through a layer of Google's Deep Dream network. I own absolutely no rights to any of the music, images, or code used to make what is presented here.